One of my favorite parts of teaching American Literature was the Transcendentalism unit. American Literature was taken by Sophomores and I thought the this unit was perfectly placed to help these budding adults figure out the world around them. For those unaware of the Transcendental movement, it was a philosophical movement in that started in the 1830s that focused on the value of the individual and the power of imagination and creativity. They were opposed slavery and supported women's suffrage. They were a progressive group of thinkers for the time. These transcendentalists included Walt Whitman, Ralph Waldo Emerson, Nathaniel Hawthorne, Henry Wadsworth Longfellow, Margret Fuller, and Henry David Thoreau. These are some of the most well known and accomplished writers in American Literature and they all were strong believers in the Transcendental ideal. As the next school year draws near, I'm always drawn to these authors and some of their most famous lines. The more I read their work, the more I see the connections to the Maker Mentality. Transcendentalists believed in all of the tenets of what I think makes up the Maker Mentality. One of my favorite parts of the Maker Community is the willingness to support one another. Makers need to be inclusive group that welcomes everyone and supports them as they go on their making journey. The Maker Mentality supports inclusivity because we grow as learners when we surround ourselves with diverse ideas. Such wise words from Margret Fuller here. Quite simply, we are destined to grow and we need to support that in our life. The Maker Mentality is about learning and understanding. Trying new things, failing, and then trying something again. Everyone has to be open to learning new things and growing as people to truly get the most out of life. One of the tenets of the Maker Mentality that matches up perfectly with Transcendentalism is the idea of being true to yourself. As makers, it is so important that who you are shines through your creations. Spending time trying to be someone you are not will reveal itself in the work. We are all someone special with amazing ideas. If we are not ourselves, we are killing ourselves. Be who you are and the world will be a better place. I love this quote because it speaks true throughout history. Some of the most important achievements in human history were done by those who were told their ideas were wrong or impossible. These visionaries could have given up and stayed in line, but they chose to be different. It is so important to be fearless when told things are wrong because being misunderstood puts you in great company of some of the most amazing makers of all time. Their belief in the tenets of the Maker Mentality led them to achieve wondrous things. There is such tremendous value in the free spirit in the Maker Mentality. We need to create spaces where students and teachers feel comfortable being uninhibited to create whatever their heart desires. A makerspace needs to be the spot in a school that allows for all learners to create freely and express who they are. I just love these words and I have a feeling they may end up on a wall in our new and expanded makerspace. The Maker Mentality is about expanding the thinking of everyone. It encourages everyone to see the world in a way that allows them to see the creative genius all people have inside. The world is our canvas and we have the ability to create whatever we want to address the world in ways that are meaningful to use. I will end with quote because it is the bit of advice I want to give to all of the teachers out there getting ready to go back to school or are just starting this week. We have the amazing opportunity to live our dreams in our classroom and help students find their dreams. We want all of the students to be able to live the life they have imagined. It is not easy for everyone and it might take more work on our part to support different students, but we can do it. This is not just follow your dreams, it is "Go confidently in the direction of your dreams." Be proud of who you are and what you know. Use that confidence to create a space in your school that allows all students to feel welcome and safe. 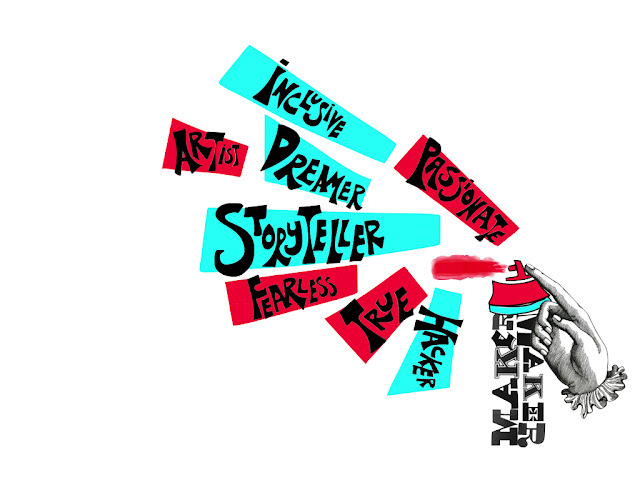 Safe to express who they are, try new things, fail fantastically and fearlessly, hack ideas, to dream, to be passionate, to be artists, and to tell their story. If you can create this environment in your classroom, you've nailed the Maker Mentality and can call yourself a transcendentalist.